1. Bellmay's organic toothiepegs teething rusks - Organic with less sodium than other rucks. I wasn't sure about rusks as the Baby Led Weaning book is against them (too much salt) but after seeing a friend's six-month-old much down on a rusk like there's no tomorrow, I figured they were fine, especially easy for when we're out and about. Not for everyday, but every now and then is fine, I think. This brand is Australian & it's always nice to buy Australian products. 2. Mamas and Papas baby snug - much like the more famous bumbo, Lulu sits in this chair to eat. Unlike the bumbo, however, the green insert comes out so she can still fit in the seat when she's bigger. 3. 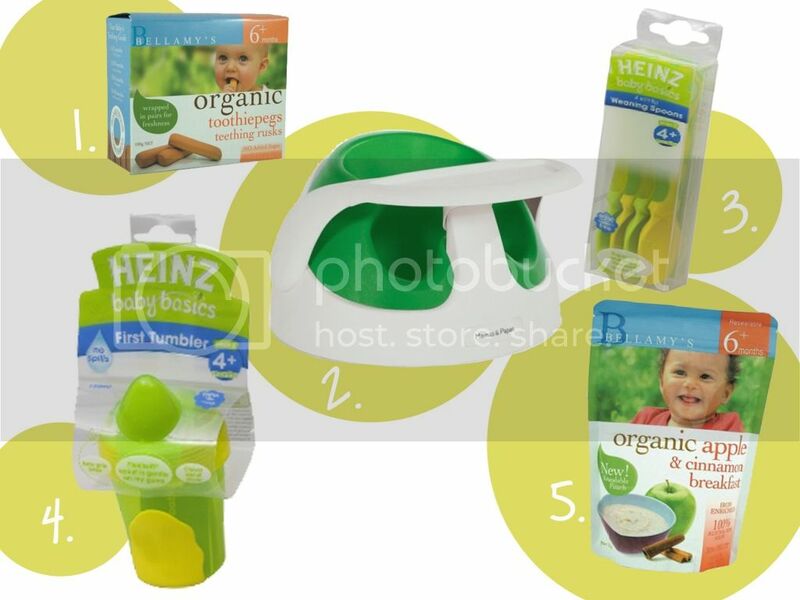 Heinz baby basics soft tip weaning spoons - Lulu loves to chew on these, with a tiny bit of food on the end. 4. Heinz first tumbler - without handles Lulu can just grasp this tumbler like she does her bottle. It also has a special valve that stops formula from falling out if it's tipped over. 5. Bellmay's organic apple and cinnamon breakfast cereal - This really doesn't have that much flavour but all the ingredients are organic and there is much, much less sodium, fat and sugar than in adult cereal. Is there anything you would add to this list? The list is by no means exhaustive, but I hope it helps someone else who may be as baffled as I was. Read about how we began on solids here.